Oh my she looks like the cat that ate the cream. She still does, it’s something about her smile. Who needs a Christmas tree if Olivia is in the room? She is the bees knees! I liked the pockets on that dress too. I have to admit it, I like the sparkle. It looks like a movie star’s dress 😉 . Also, I envy people who can wear those kinds of pockets. 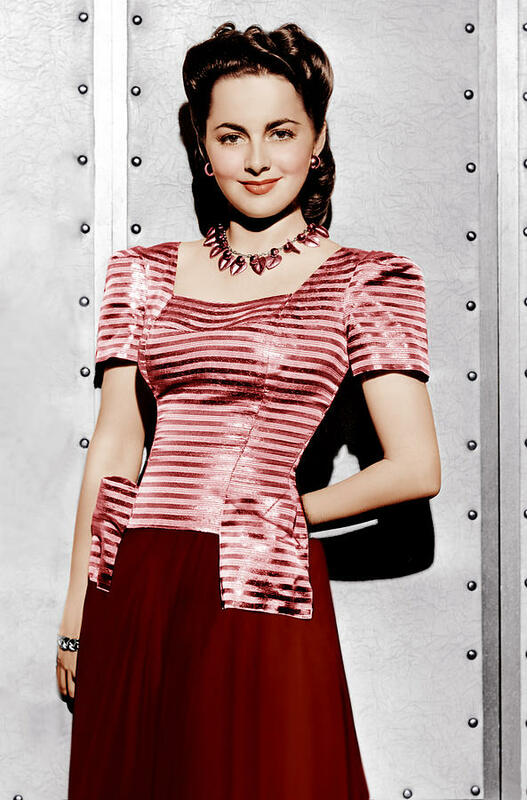 She looks like she weighs about 107 pounds there, and women then were smaller, I think most actresses of that era were just a little over 5 feet. Vickie, you are right about actress’ for the most part were shorter. As a photographer for the past 54 years, knowing what the height of some actress’ were, I could tell who was short and who was tall. Also, I want to thank you for the Hollywood Glamour shots the I had never seen before, and I have a gig collection of them. The one of Thelma Todd is a great example. I did a lot of research on her and got a big surprise. When I open my e-mail I go through BEGUILING HOLLYWOOD first. On the Road of Life, the one I was on that day lead me to you. Vickie,yes her smile is very alluring indeed. That’s a pretty amazing photo! How lovely is she? I’m happy to have corresponded with her. She’s a wonderful person.